At a recent garden event I asked Deborah Myers from Portland Nursery if she was seeing or hearing any new trends from customers. She immediately replied that yes, she was seeing middle school aged kids bringing their parents into the nursery to buy vegetable seeds and plants. The kids were telling their parents what vegetables to buy and even why they should. Deborah said she was surprised to notice such talk coming from kids, and even more surprised the parents were listening. The kids were saying things like, “This is a good source of vitamin A,” “This is high in fiber,” “This is easy to grow,” and so on. Some of the kids even talked about pollinator-friendly plants. It turned out that these kids had learned vegetable gardening hands-on at their school. • The total number of public schools (K–12) in Oregon with an edible vegetable garden is 662, or 46 percent of the total number of schools in Oregon. • In Multnomah County (most of Portland), the figure is 66 percent. Some school gardens have expanded. In addition to vegetables, they might have raspberries or kiwi, which kids especially love. What happens with the harvest? Often it is eaten on the spot! The school cafeteria is a recipient, as are local food banks. There is usually one teacher in charge and the best programs occur when all teachers are involved. Rick mentioned that there are many areas of subject matter that can be taught from a school garden. Botany and horticulture of course come to mind, but also science, math, nutrition, reading, writing and health. In addition, there are the benefits of being outdoors and getting some physical exercise. School gardening programs provide an ideal opportunity for local garden centers to get involved with their community and the young people who are eager to learn about gardening. My guess is that many kids today have no idea where the produce they eat comes from, other than their grocery store! In the Portland metro area, Al’s Garden & Home has sponsored Al’s Kids Club for more than 20 years. Amy Bigej, director of education for Al’s, told me that the number of kids who participate in the series of educational classes keeps increasing every year. 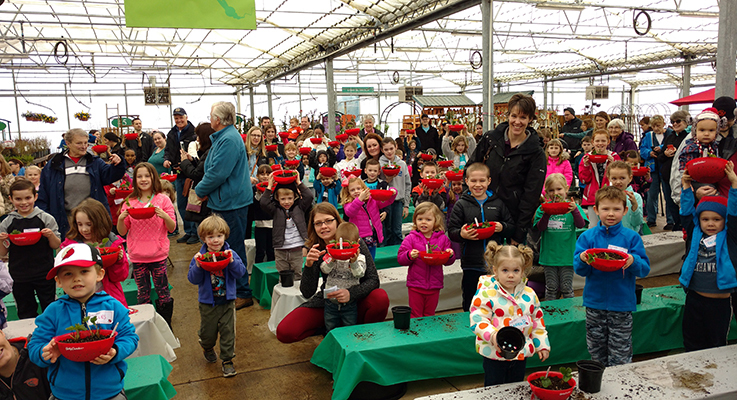 The subject of the March class was growing strawberries, which attracted more than 400 kids! With parents bringing their kids, imagine the shopping potential such an experience creates. The April class was called “Grow an Edible Rainbow,” which taught kids to plant the seeds of tomatoes, purple beans, cucumbers and sweet corn. The goal is not only to get kids into edible gardening, but also to understand why it is good for us. For example, kids learn about the parts of a plant and how the edible parts of some plants are underground, and then they are asked if they can name vegetables that grow underground. Sometimes there are questions that even parents may not know; for instance, what is the difference between a fruit and a vegetable? This entire educational concept could and should spread to other garden centers. What an exciting way to increase the interaction between local plant retailers and their communities! Amy said she’s seen the story come full circle, with former kids who are now adults starting their own garden. Several weeks ago, a young man, now married, came up to her and introduced himself as a former member of Al’s Kids Club. He said he was in middle school when he joined, and that it was his first gardening experience. Now he wanted to pass his love for gardening on to his kids. Many in the gardening community think that a generation of gardeners was lost or at least reduced significantly during the 1980s and 1990s. Many factors contributed. City lots became smaller, limiting the space for a garden. There were too many trees planted and fewer sunny areas. People were unfamiliar with gardens since it was not part of their upbringing. Not least of all, the rise of technology came at the expense of interaction with the natural world. Time, or the lack thereof, is another big factor. It requires time to plant and tend a garden. Today’s parents have their kids enrolled in so many activities that little time is set aside for gardening. With the budget cuts schools are facing today, I can think of no better time for local garden centers to step up and support — or start — a school garden program. It is not only in the best interest of business, but it is also for the well being of our planet and the next generation of kids who will be future customers. It benefits everyone!